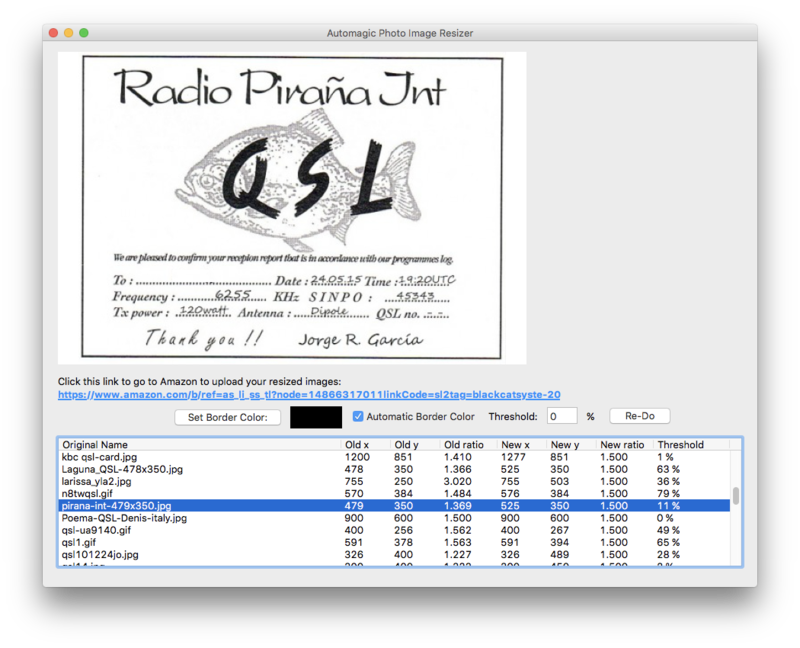 Automagic Photo Image Resizer lets you quickly and easily resize images so they can be printed as photos using Amazon Prints, without cropping any of the image, so you can see the entire image. A border is added to images as necessary so they have the correct aspect ratio. Images are also converted to JPEG format, which is what Amazon Prints wants. You can resize single images, as well as batch resize an entire directory (folder) of images, in just seconds. Note that the aspect ratio of the image is changed to match that of the desired photo size, but the image is not "resized". From the Size menu, select the size of the photo you will print, so the image will have the correct extra border added so it is the desired aspect ratio. Select the color of the border you want to add by clicking the Set Border Color button, or check the Automatic Border Color checkbox. If you want to use the automatic color selection, you also need to set the threshold, that is, the percentage of pixels around the edge of the picture that must be the same color for that color to be chosen (the color most often appearing on the edge will be selected). You can set this threshold to 0 in which case the color most often appearing will always be used. You might not know what value to select, that's OK, ignore it for now, and you can change it later. Select Resize Image from the File menu, and select your image file, which can be a JPEG, PNG, or GIF format file. You will then be prompted to select the name and location of the resized file. This will always be a JPEG file. Note that if you select a file that already exists, it will be overwritten! The image will be resized by adding a border to the top and bottom, or left and right sides, as necessary, so the resulting image is the correct aspect ratio. The file will be saved, and displayed, so you can see what it looks like. Some information will also appear at the bottom of the window, the name of the file, the dimensions of the original image and the aspect ratio, the dimensions and aspect ratio of the new image, and the threshold of the most common color on the edge. You can use this threshold value if you wish when you re convert the image (if you decide to). If you want to change anything, such as the border color, automatic mode, threshold, or image size (aspect ratio) you can do so, then click the Re-Do button, and the image will be re-processed and saved, without having to re-specify the input and output file names. Once you are done and satisfied with your image, you can upload it to Amazon Prints for printing as a photo. You can use this URL to do so, which is linked to my Amazon Associates account. This means that Amazon pays me a tiny amount of money when the photos are printed, which helps support development of this app. But don't worry, it does not increase the price you pay! The procedure is similar. Select the size of the photos you will print, for the correct aspect ratio. Note that if you want to print some images as one size and others as another size, you will need to process each set of images of the same size separately. Also select the border color, automatic mode, etc. Now select Resize Directory from the File menu and select the directory containing your image files, which can be a JPEG, PNG, or GIF format file. You will then be prompted to select the directory to store the resized files. These will always be in JPEG format. Note that if you select a directory containing files that already exists, they will be overwritten without warning! It may take a few moments to process all of the files, depending on how many there are. Once you are done and satisfied with your images, you can upload them to Amazon Prints for printing as photos. You can use this URL to do so, which is linked to my Amazon Associates account. This means that Amazon pays me a tiny amount of money when the photos are printed, which helps support development of this app. But don't worry, it does not increase the price you pay!